There is something universal about every human condition. Language does not change it. Geography does not change it. Personality, nationality, and religious tendencies do not change it. Love that lights the eyes of a soul, looks the same no matter the color of irises. Arms that reach out in tenderness can be of any color or size, dressed or naked. Sorrow, despair, agony and depravity are all pregnant with God-touched opportunity. These are the conditions that form the questions of “when, how, where, and why” from the depths of souls world-wide. Embalmed with freedom or anchored to yet more slavery; sorrow seeks to unhinge the hands that lay hold of anything but the One who made them. Human beings are always at the peak of ability to learn when their mind, body and emotions are tossed into the sea of adversity, trial, suffering, loss, and torture. We can learn in happiness, but it doesn’t retain the depth of engraving on the memory as sorrow. Hence why we forget the good so quickly when hardship starts to ink it’s way into our grey matter. Likewise we recall so well the negative and hopelessness colors our spirits so immediate we feel shot into another world in an instant. There is no place else that brings us all to a unified place in the human condition. It’s often said love is such a place but I beg the differ. There are too many illusions of love for such a unity to be possible. No one is can paint sorrow with different colors. It’s very darkness outlines the same light no matter the shadow of the Sun or moon in the sky. All my life it seems as if God has placed some special favor on me. Where my sister seemed to struggle and have to push for the simplest joys. Yet at every turn, our sorrows held the same DNA of pain and questions. Circumstances are the greatest illusions of favoritism. As I write, my sister sits where she is full of joys, doubts, gratitude, and questions the same as I. Yet, on the outside anyone would say she has it harder than I. Often I’m tempted to agree. Yet in each of our varying circumstances these things are the same: We are in places where God has provided abundantly, yet wonder what is next. We struggle with hurt, resentment, anger, bitterness, physical deficiencies, heart aches and knee bloodying prayers for our children and grandchildren; loved ones, we both sing, we both cry, we both are loved and misunderstood. That which makes us up inside, pours out from within, and effects us from without though incredibly unique, we are the same. Both of us are being taught everyday Who made us and why. We both have illusions, deceit, kindness, generosity, compassion, tendencies to complain, aches and pains, things hidden and things exposed, things being revealed, things on the way to unveiling, promise, hope and despair and sorrow. The purpose of comparison is not for comparison itself, but for defining the difference between what’s on the outside and what’s on the inside. Outside looks different, inside does not. You make known to me the path of life; in Your presence is unbounded joy, in Your right hand eternal delight. The Word of God is true for one and all, all the time, everywhere. The above scripture offers the same salve to the human heart no matter their circumstances. Sorrow is an opportunity to watch God become a heavenly Father for every soul on earth. Pain provides the path to true knowing who we are and why we’re here. God alone can provide the answers to our questions, and keeps them all open-ended. The answer today will not be the same as tomorrow. Except that Who He is and how He loves us, desires us and reaches for us, never changes and carries not one ounce of favor for one over the other. Our circumstances can not and must not define the riches of His glory. Circumstances are all of the following: outward characters, features; singleness or married, childless or having children, wealthy or poor, sick or healthy, geographic locations, personality traits, internal make up, extroverted or introverted, talented with art or talented with intellect, high or low IQ’s. To name a few, but hitting the main things. Everyone one of those things are the intricate detail drawn by the Hand of Adonai on each one for their good and those they effect and His glory. Sorrow gives us the glasses to correct our vision in life; for joy is it’s designation and it won’t stop until it’s reached its goal. For you, for me, thanks be to God! The definition of true joy for every soul He made is Himself, nothing more and absolutely nothing less. For I have satisfied the weary and filled the needs of all in distress. Come to ME, all of you who are struggling and burdened, and I will give you rest. The reason why our Messiah invited all who are struggling and burdened but not “happy” is because we all are struggling and burdened, not happy. Oh we may have joy and contentment, but they always come after sorrow, and after we have accepted His invitation to receive such rest. Waiting on Him, running to Him is the only path to such joy and peace/rest. For each of us this is the same. Sorrow aimed at His unveiling, His presence, His company, His love, His compassion, His comfort, His answer, His directions, His discernment, this is sorrows purpose. Don’t miss the opportunity. Don’t be tempted to compare, or focus on the outward appearance of things. 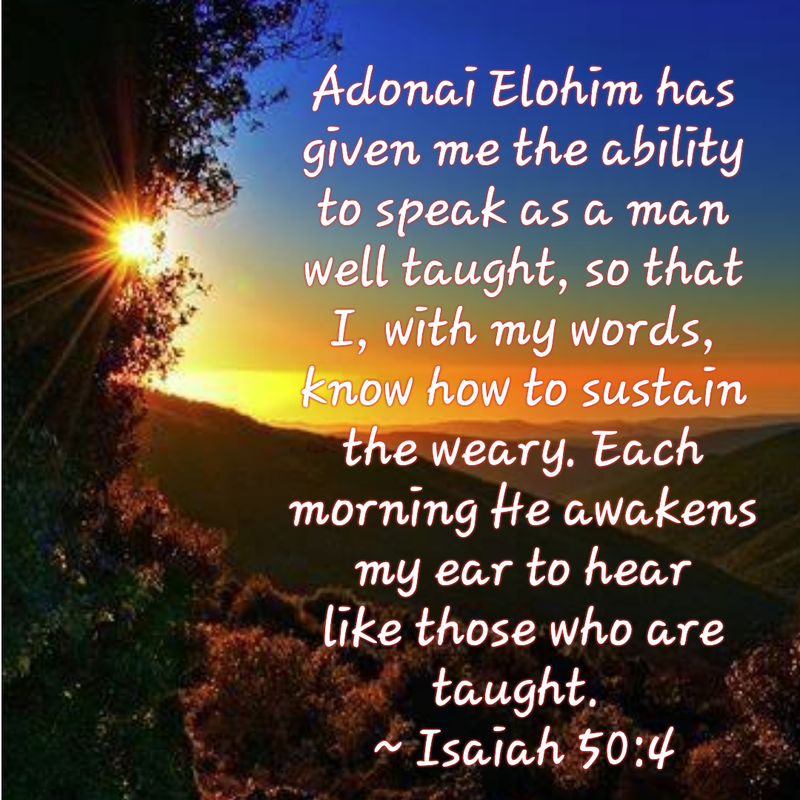 Hold on to Yeshua (Jesus) our Messiah and Master… and let Him order up the exact prescription for your knowing Him. Pray for each other thusly. Praise Him in their joys and walk beside them in their sorrows.